Days Inn Richmond Hill welcomes you to the Savannah Georgia area. 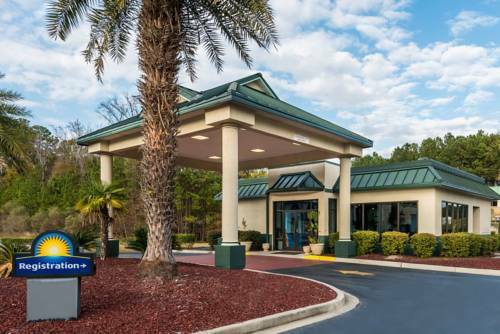 Our beautiful hotel is located in Richmond Hill at exit 87, offering easy access to I-95 and all the popular surrounding areas. When you are traveling to or through the Savannah/Richmond Hill area, please keep this quiet and convenient location in mind. We are only 5 hours away from the Daytona/Orlando area, and offer High Speed Wireless Internet Access. Our Richmond Hill property provides you an affordable option with a high quality product that is clean and comfortable. Richmond Hill is conveniently located off of I-95 and US 17 at Exit 87. Our Richmond Hill Days Inn offers the best of Hospitality and service. Richmond Hill is within minutes of major attractions and historical sites. We offer ample parking for all size vehicles including Buses and Trucks. We have a 24 hours Dennys Restaurant on premises offering a 10 Percent discount to all guests. Our beautifully appointed rooms offer two double beds with microfridge, 25-inch remote TVs with 78 channels including HBO, iron and ironing board, hair dryer, radio alarm clock and free coffee/tea and hot chocolate in the lobby each morning from 6-10am. Pets Accepted with a 10.00 fee plus tax per pet per night that must be collected from guest at check-in. We also serve continental breakfast. Renovated in 2013.